A former lacrosse coach at Lansdale Catholic High School was arrested July 17 in Montgomery County for allegedly sending false claims of sexual abuse by coaches at the school in anonymous emails to the Archdiocese of Philadelphia. 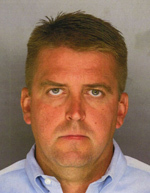 Timothy Udinski, who last coached boys’ lacrosse at Lansdale Catholic in the 2010-2011 season, was charged with harassment and stalking by the Montgomery County District Attorney’s Office. The messages were sent anonymously to the Archdiocese from last October until late last May, claiming sexual solicitation or assault by coaches of the football and lacrosse teams at the school. In a statement, the Archdiocese said the accusations were immediately reported to law enforcement. The Montgomery County DA’s office began an investigation that involved 12 county detectives and staff members who spent 184 hours, interviewed 97 people and executed 10 court orders and search warrants. Following the probe detectives and prosecutors found the allegations against the coaches to be “false and unfounded,” the DA’s office said in its statement. After detectives confronted Udinski June 21, he admitted to sending seven anonymous email messages and that their complaints were untrue. Lansdale Catholic High School President Jim Casey expressed the school’s gratitude to the Montgomery County DA’s office. Udinski was arraigned before Magisterial District Judge Harold Borak and released on $25,000 unsecured bail. A preliminary hearing on Udinski’s case is set for July 27.